LONDON--(BUSINESS WIRE)--Some of the world’s top urban mobility leaders today unveiled the world’s first comprehensive multi-modal trip planner, a solution to reduce congestion in cities around the world that will enable developers to build richer apps for consumers to get around their cities. 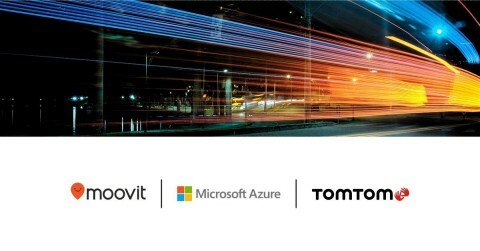 Executives from Moovit, a leading Mobility as a Service (MaaS) provider and the world’s #1 transit app, TomTom, the location technology specialist, and Microsoft’s Azure Maps demonstrated the solution that identifies all of the driving, parking, and public transit options, and surfaces them in a single package for map users. This will be particularly useful for suburbanites who don’t know where to park their car or which transit line to take in lieu of driving into the city. Moovit (www.moovit.com) is a leading Mobility as a Service (MaaS) provider and the world’s #1 urban mobility app. Moovit simplifies your urban mobility all around the world, making getting around town via transit easier and more convenient. By combining information from public transit operators and authorities with live information from the user community, Moovit offers travelers a real-time picture, including the best route for the journey. Named Best Local App by Google in 2016, finalist for Google’s Build for Billions category in 2018 and one of Apple’s Best Apps of 2017, Moovit launched in 2012 and now has 350 million users. Moovit amasses up to four billion anonymous data points a day to add to the world’s largest repository of transit data. The data gathering is aided by Moovit’s network of more than 550,000 local editors called “Mooviters.” These passionate users help map and maintain local transit information in cities that would otherwise be unserved. Mooviters account for 65 percent of the hundreds of cities Moovit opens every year and make Moovit the Wikipedia of Transit. Moovit is an early pioneer of Mobility as a Service (MaaS). The company helps people change the way they consume mobility by fully integrating other forms of transport, such as local bicycle services, into its app. In 2017 Moovit launched its suite of MaaS solutions to help cities, governments and transit operators improve urban mobility in their cities. Moovit is available for free on iOS, Android and the Web in more than 2,700 cities, across 88 countries, and can be used in 44 languages. More than 100 cities and global events, including Rio de Janeiro for the 2016 Olympics, have made Moovit their official transit app.